I took a look at the Sonoma County Office of Education ("SCOE") press release regarding "Similar Schools" rankings in Sonoma County yesterday. For Sonoma Valley parents reading the headline, these numbers feed a low level panic about the perceived "decline" of the Sonoma Valley public schools. I've blogged about this before, looking at the Base API scores, but this uses the second measure, and SCOE touts the standard as more persuasive for year-to-year measures. Since this is an issue that I am (intensely!) interested in, I decided to take a thorough look. The Similar Schools ranking is based on a detailed assessment protocol that is explained here. I could delve into the mechanics of the standard, but for a blog post, or for working purposes, the important takeaway from the Similar Schools ranking is that it all comes down to a number, the SCI, or "School Characteristics Index." The state lines these numbers up, from highest to lowest, and then takes the 100 schools closest to any given school -- whatever 100 come closest on the SCI measure -- and that's the comparison pool for the Similar Schools ranking. OK, obviously, the entire Similar Schools ranking depends upon the SCI producing good results. You'd think that the SCI for any given year, for a school, would be a really easy piece of data to get at. Getting at the SCI measures of California's schools requires you to take a look at this page, which has the raw data for the California Department of Education's calculations of all these scores. The data itself is either in a text file (have fun trying to work with that, it's not even comma delimited, it's fixed width, seriously, who made that decision?) or a DBF. What is DBF, you say? Why, that's dBase, for all you old Ashton-Tate fans in the audience. Yeah, a database product where the vendor went out of business in 1991. Thankfully, the computer software industry is full of people who, on their own time, work on software tools and provide them for free to the community, to deal with problems precisely like this one. For a DBF file, I was able to grab Apache OpenOffice, whose open source product can read DBF files. Of course, that's only part of the problem. The minute you've actually got the DBF file working, you're immediately confronted with 22,000+ rows of data, each with 150 different fields of data, and let me tell you, the fields themselves don't exactly have the most descriptive names ever. Does anyone know what "CWM2_91" is just by looking at it? Of course not. You need this translation table. "ST_RANK", "VALID", "SIM_RANK", "API12B", "STYPE"
So after all this searching, and working with a custom SQL query, I ended up with the query in the diagram on the right, which gave me all of the High Schools in California, ordered by their SCI. As a human being, I am not going to work with the 100 schools closest to Sonoma Valley high -- I cut it down to the 20 closest. There's a good reason for that, of course -- I am not going to merely rely on the SCI, but I am going to examine those schools that it says are similar, to see if the real world characteristics of those schools allow the SCI results to be validated by common sense. The table of the 20 schools most similar to Sonoma Valley High, according to SCI, is on the right. First, I want to point out that the only North Bay school that the SCI says is similar to Sonoma Valley High is Petaluma High. 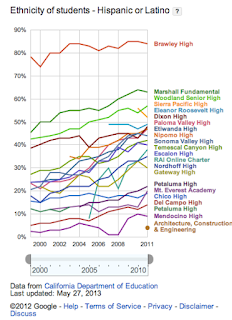 I've blogged about which Marin-Napa-Sonoma high schools are most similar to Sonoma Valley High before; the ones that are actually similar based on population are Vintage, Napa High, Piner, Windsor, Healdsburg, and Cloverdale. 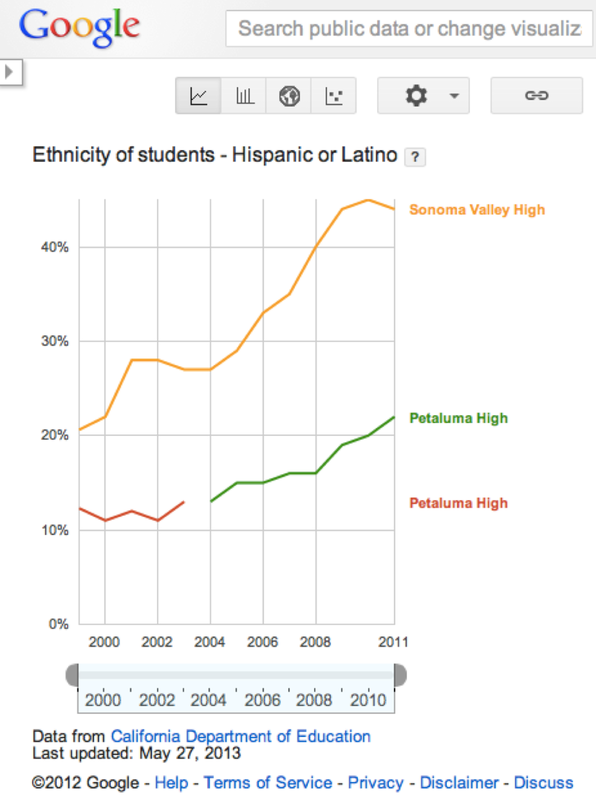 There's a really simple reason I exclude Petaluma High from that list, and the graph of why is on the right. 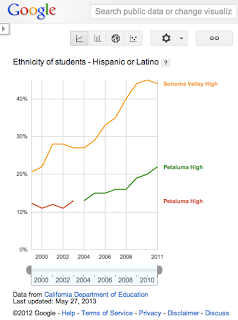 Petaluma High's student population is an ethnic monoculture -- there's no way you could do dual immersion there. Petaluma High, like Sonoma Charter, is really more about the past of California education, not its future. That's only the first problem with the "similar schools" to Sonoma Valley High. Looking closer, the SCI puts four schools with under 200 students in the 20 closest to Sonoma Valley High. These schools are all either "10" or "1" on the similar school ranking -- they're at the extremes. I tossed them all because schools that small are just obviously different from a high school with ~1,000 students. The SCI index creators should have tossed these schools too -- when the SCI was created in 1999, it deliberately excluded all "small schools" and it drew the cutoff at 100 students. There really weren't that many schools between 100-200 students in those days, but the proliferation of customized charters in the subsequent ~15 years has changed that (and I bet the SCI, if they redid it today, would exclude them). The schools I really want to see the SCI expose for me are those schools that, on a statewide basis, are similar to Vintage, Windsor, Healdsburg, and the other Marin-Napa-Sonoma schools like Sonoma Valley High. So I went and used the Google Public Data Explorer to show me the graph of the changing population at each of these 20 schools since 1999. That graph is on the right. Three of the schools have a similar pattern (a change from an ethnic monoculture to diversity) similar to Sonoma Valley, but are "9's" on the similar schools ranking. They are Paloma Valley High, Eleanor Roosevelt High (what a great name for a high school! ), and Etiwanda High. Each has nearly 2,000 students, so they're nearly twice the size of Sonoma Valley High (other end of the spectrum from the small-fry problem), but I still think intuitively that their experiences are relevant to Sonoma Valley ... a 1,000 student school and an 1,800 student school seem more like each other than either does to a 150 student high school. So I took a look at these three high schools, and there are three shared characteristics that jump out right away. First, the schools are new. Eleanor Roosevelt High opened in 2007. Etiwanda, the oldest, is still a relatively young school, as it opened in 1983. All thus benefited from something we now know as Mello-Roos bonds, which are a funding device (really, an end run) used for schools to avoid the harsh consequences of Prop. 13. So there's a maintenance advantage versus an established school, like Sonoma Valley High. Second, two of the schools are in Riverside County, and the other's in San Bernardino. They are in very, very rapidly growing communities. The job growth in Rancho Cucamonga (Etiwanda) in the last decade has been 32.79%. In Menifee (Paloma Valley) it's been 133.15%. In Eastvale (Roosevelt) it's been 1,406.79%. There aren't specific figures for Sonoma Valley, but in the surrounding communities the job growth has been 6.15% (Napa), 1.73% (Petaluma) and a whopping 0.67% (Novato). So these are very rapidly growing communities, which really helps, of course, with the tax base. Third, the character of the residents is different, too. Sonoma Valley's economy is driven by agriculture, tourism, and services. It's essentially a rural community. San Bernardino and Riverside are exurbs, where the growth is being driven by the greater Los Angeles economy, as people seek a better ratio between income and home price. The average wages in these cities show that -- for example, in Eastvale, the median family income is $112,145 -- that's on par with some of the most select communities in Marin County -- while the median family income in, say, Santa Rosa, by contrast, is $76,083. This really does tell the story of why these schools, although the SCI might call them "similar," are anything but. That brings me to a larger point, though. It looks like there's two ways to "move the needle" on the Similar Schools Ranking. The first is to implement the kind of growth policies that we see in Riverside and San Bernardino -- the kind of policies that we see in places like Houston, Texas, which I've blogged about previously. When you have a rocking economy, it can really help the school system. The second way, what I think of as the Healdsburg model, is that you can simply spend more per student, whether through taxes, bonds, or otherwise, if your voters will give you the necessary support at the ballot box. One of the interesting things about Sonoma, is that we're in the middle of a debate that touches on this issue. The supporters of Preserving Sonoma would (I'm just guessing now, but it's a good guess) find the development policies of, oh, Rancho Cucamonga, say, alien at best. That's not to argue that we can't match the performance of those cities without adopting, wholesale, the policies of Orange County Republicans, but it requires us to recognize a basic unity between the different parts of our local government -- that the growth of the tax base (which is really regulated and controlled by cities and the counties) has a very significant impact on the school system. While the cities and counties may be able to provide for themselves (barely) while holding down growth, that policy can prove fatal for a local school district absent an increase in taxes. 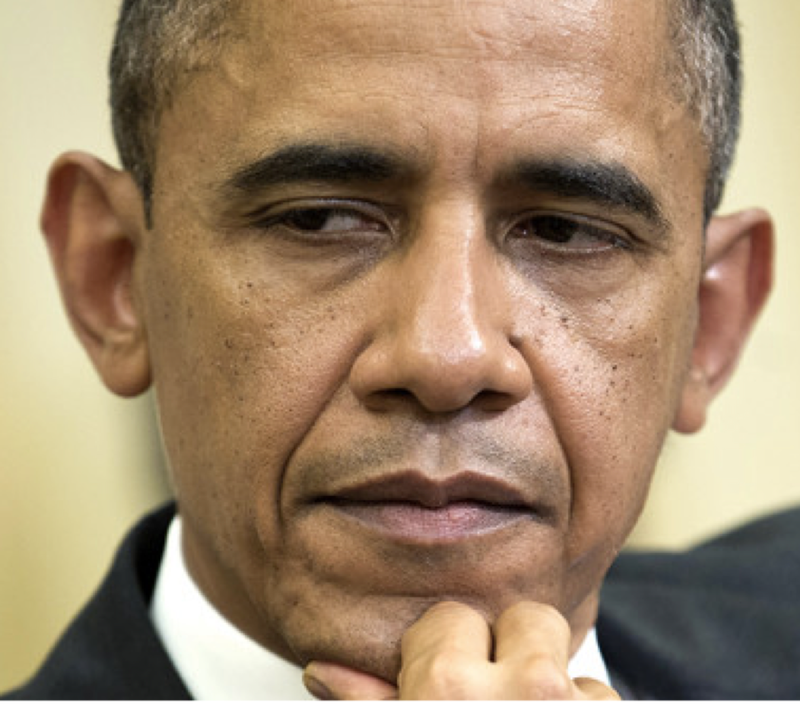 There was a nice opportunity provided by the Press Democrat to illustrate that issue earlier this week. On the same day, the paper reported that Windsor's Town Government's finances are recovering, while simultaneously reporting that the Windsor School District is in the worst financial shape in Sonoma County, such that the State believes it could very well run out of money in the next 24 months. The story is capped off by the final quote of the article about the Town budget, from Heather Ippoliti, the administrative services director. In discussing the local economy, she notes that “[w]e’re starting to see signs of a recovery. But a full recovery will be slow and take many years.” While the Town's funding may have stabilized, the Town has been insulated from the true impacts of the economic crisis Windsor's gone through, which are ultimately being felt by the school district. Windsor, as a community, is confronted by the fact that either the City can get growth moving, or the residents can vote to increase the burden on themselves as taxpayers, but that there are no obvious solutions to the problem short of those two choices. But my final point is really about the credibility of the "Similar Schools Ranking." Getting at the data was certainly not easy; it's not put in a publicly accessible form on the web, and you need knowledge of both twenty-year-old database software, and how to create SQL queries, to do any real analysis with it. Once the black box is pulled apart, it's pretty obvious that what the California Department of Education is considering "similar" is nothing like what common sense would dictate. 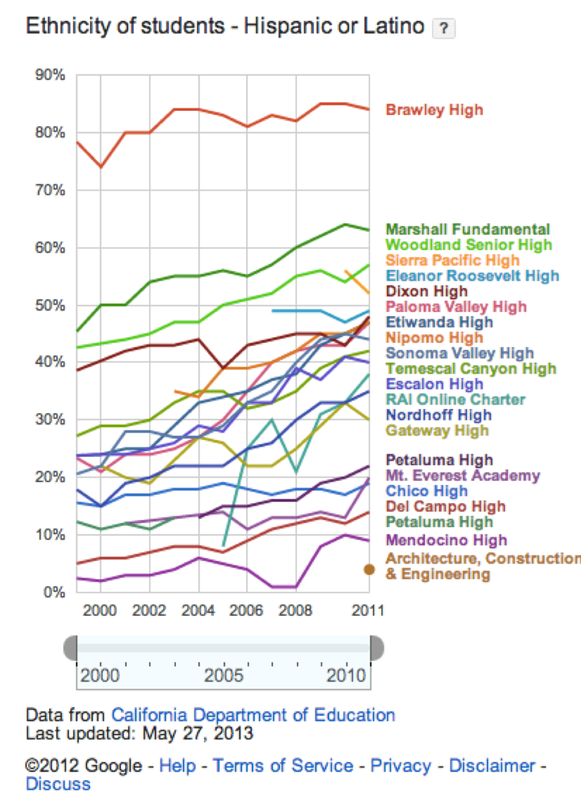 When measured against the area schools that actually are similar, like Vintage, Windsor, Healdsburg, Napa High, Piner, and Cloverdale, Sonoma Valley High (and SVUSD), given the resources we as a community have provided them, are doing pretty darn well. Sonoma County's 2013 National Merit Scholars. One of the problems with modern life is the plethora of ranking systems. Sometimes, it seems as if there's something like Gresham's Law going on -- that bad rankings drive out good. Finding the ones that are accurate can take time, simply because the lowest quality measures are often blared loudly. Thus, I think it's important to note the significant ones when they are announced. The Press Democrat reported today on the National Merit Scholarship recipients for Sonoma County. There are three -- Jordan Lawder French, from Petaluma High, Andrew Yu, from Cardinal Newman, and Nicolle Bertozzi, from Santa Rosa High. 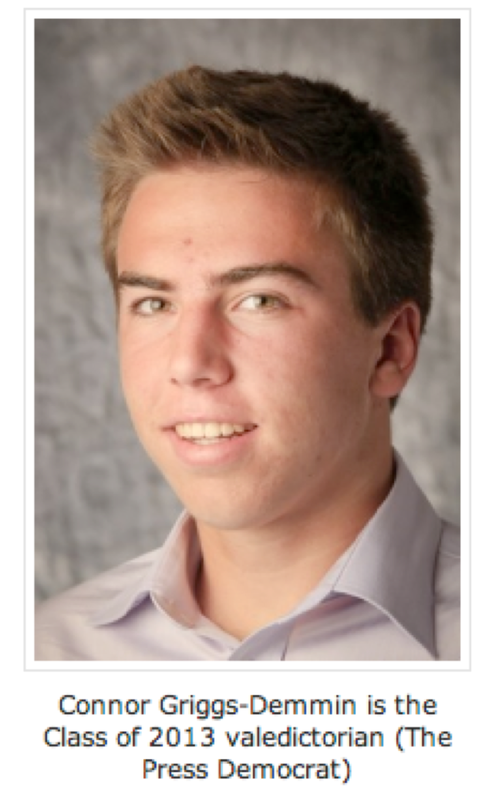 Sonoma Valley High's own valedictorian, Connor Griggs-Demmin, was named a National Merit Commended Student. There are about 34,000 Commended Students nationwide. About 15,000 students make it to the Finalist stage, and ~8,300 actually get scholarships. The criteria is rigorous -- the finalist's academic record, information about the school's curricula and grading system, two sets of test scores, the high school official's written recommendation, information about the student's activities and leadership, and the Finalist's own essay are all evaluated. "Mr Obama has issued a series of directives trying to strengthen the system of background checks on those who buy guns. After Congress blocked the administration's attempt to close loopholes on sales online and at gun shows, he has instructed all federal law-enforcement agencies to co-ordinate more closely to improve the database that the checks rely on. The Department of Justice is offering $20m in grants to encourage states to submit more information to the database." "I will use whatever power this office holds to engage my fellow citizens -- from law enforcement to mental health professionals to parents and educators -- in an effort aimed at preventing more tragedies like this ..."
This one has come up a couple of times before here (a set of links are below). ... While the ATF Moves on Big Data. Malala Yousafzai and "Girl Rising." I was taking a look at Apple's movie trailers site this morning, looking for the Man of Steel trailer after reading this New York Times' article. I clicked the "Most Popular" button, wondering which has been viewed the most. I figured it'd be Iron Man 3 or Star Trek: Into Darkness. It's not. It's Girl Rising. Here is the Wikipedia article about the now-15-year-old Malala Yousafzai.